We now present the questions in full and the results of the visionaries' brief answers. 2. Does she look rather "slender", slim or . . .? She looks as usual - she looks the same. 10. Naturally your Madonna also has her own face. How does it look: round or rather long - oval? It's rather long - oval - normal. Normal - rather light - rosy cheeks. Normal - mainly light like her face. 13. What kind of lips does Our Lady have - rather thick or thin? Normal - beautiful - they are more thin. 17. What is the colour of Our Lady's eyes? Normal - no special colour. 23. And Our Lady's eyebrows? Her eyebrows are thin - normal - more of a black colour. She is clothed in a simple woman's dress. All the way down to the little cloud on which she's standing - it blends into the cloud. 29. 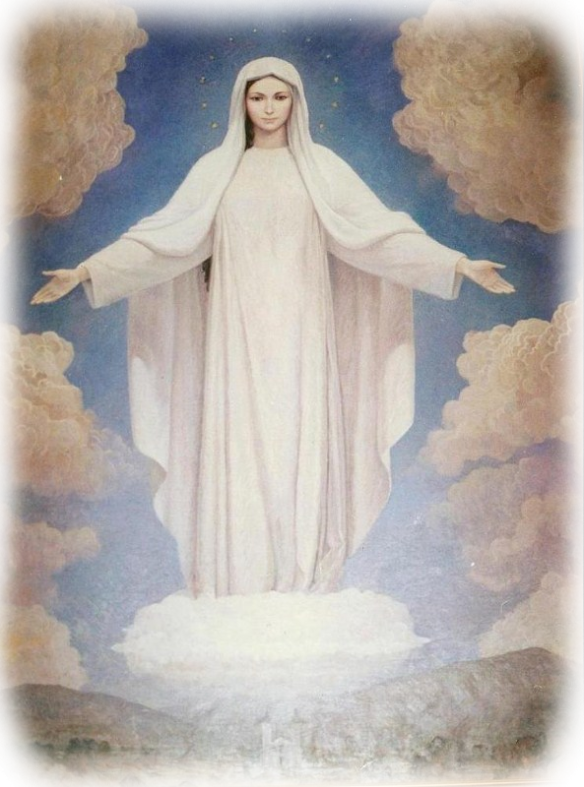 Is a part of Our Lady's neck visible? 31. Is Our Lady's dress hemmed with anything? 32. Is there anything pulled in or tied around Our Lady's waist? 40. Does the veil look firmer, thicker than Our Lady's dress? Yes - she has a crown of stars on her head. 50. Is a little bit of Our Lady's hair visible? A little above her forehead - from under the veil - from the left side. 53. 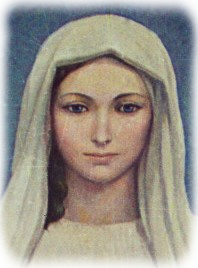 Is either of Our Lady's ears ever visible? Almost never - maybe sometimes at the "Glory be". Her palms are usually relaxed upwards - her fingers are relaxed in the same way. 61. How are they - which colour are they? 62. Have you ever seen Our Lady's legs? No - never - her dress always covers them. Well, really we haven't told you anything about that - her beauty cannot be described - it is not our kind of beauty - that is something ethereal - something heavenly - something that we'll only see in Paradise - and then only to a certain degree.